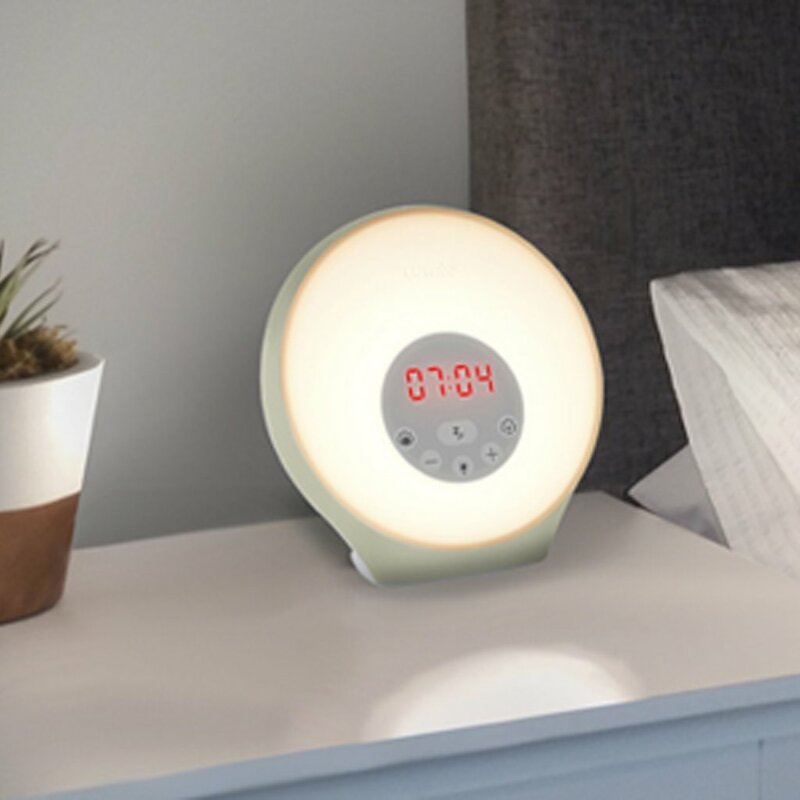 Lumie are constantly bringing out new exciting products and the Sunrise Alarm is the latest addition to their fantastic line up! Price wise the Sunrise Alarm is very affordable. It has an RRP of £39.99 but is currently available to buy from the Lumie website for just £29.99! It is not as sophisticated as the body clocks but still packs lots of features for the price! So, grab it quick whilst it’s on sale. I have a feeling it won’t be at that bargain price for long. The mood colour modes are interesting, choose from green, red, blue, pink, orange, light blue. You might find them a bit of fun if you need an alarm clock to coax your teens up for school and college! My eldest is starting to find the early starts for secondary school tricky. His bed is too warm and comfortable and he doesn’t want to leave it. The gradually brightening lights and wake up sounds are just what he needed. The mornings are so dark and depressing. The cheery sounds of birdsong can be quite therapeutic! It really helps lift your spirits. There is a total of five wake-up sounds to pick from. They are Blackbird, Osprey, Goats, Tree frogs and a Kitten purring. So, you can see which works best for you or alternatively opt for the more traditional beep sound. But I find beeps just puts me in a bad mood! Natural sounds work much more effectively for me. Watch the little Lumie video below if you want to hear the sounds for yourselves. I think this is going to prove to be a very popular product for Lumie. I have one Lumie Sunrise Alarm to giveaway on my blog by filling in the form below. The competition will close on the 21st of February. I also have a second one I am giving away on my Instagram page so do check that out too to double your chances. That closes earlier on the 10th of February. Make sure you also see what other competitions I have running. This sounds like the type of alarm clock I need this time of year. I find it so hard to get out of bed. I need a stick of dynamite to help me get out of bed in winter, and I hate the bleep of an alarm telling me I will have to leave my warm bed. A gentle wake up to the sound of a blackbird, or a tree frog is much more like it!